Chronic exposure to manganese oxide fumes, which occur when manganese metal is heated and reacts with oxygen, can lead to damage to the central nervous system. Welders are especially susceptible to this disease, called maganism by the National Institutes of Health, because manganese is found in many welding rods and filler metals to promote hardness. The American Conference of Governmental Industrial Hygienists recently issued guidance that dramatically reduced suggested threshold limit values. Because many metal fabricators use this guidance to manage worker exposure, they now are having to rethink how they approach personal protective equipment. Although OSHA maintains a permissible exposure limit of 5 mg/m3 for manganese compounds, many companies elect to follow much tighter guidelines. Those companies that follow guidance from the American Conference of Governmental Industrial Hygienists might be somewhat surprised to learn that the association has reduced its recommendation for manganese fume exposure—almost 250 times less than the federal limit. Metal fabricators that think they are doing their best to protect their welders may need to revisit that notion after a leading industrial health and safety organization adopted new guidance in February 2013 concerning manganese. The American Conference of Governmental Industrial Hygienists (ACGIH) recommended a 10-fold reduction in the time-weighted average (TWA) (measured over an eight-hour shift) threshold limit value (TLV) for respirable manganese particulate. The association reduced the respirable TLV-TWA limit of 0.2 mg/m3 to 0.02 mg/m3. According to the new TLV, a person should not breathe in more than 0.02 milligrams per cubic meter of air (mg/m3) of manganese over an eight-hour work period. The respirable fraction is the smallest size fraction typically sampled. These particles are less than 4-µm mass median aerodynamic diameter, which covers particulate typically found in welding fumes. As a result, most industrial hygienists and safety officials rely on this TLV-TWA when evaluating welding exposures. The ACGIH also issued new guidance for inhalable manganese, particulate that can be inhaled into the nose and mouth but not likely to be inhaled into the deep lungs because of size. These larger particles might result from grinding activities rather than welding. The new recommended TLV-TWA for inhalable manganese is 0.1 mg/m3. It should be noted that this guidance is not a governmental regulation. The current federal Occupational Safety and Health Administration (OSHA) permissible exposure limit (PEL) for manganese compounds is 5 mg/m3. This is a ceiling limit, which means the exposure shall at no time exceed the exposure limit given for a particular substance, in this case manganese. For the most part, if metal fabricators meet this standard on the shop floor, they are complying with federal law, but in some instances, state plans may prove to be stricter. If a fabricator is located in an area where it falls under the jurisdiction of a state-sponsored safety and health agency, it should consult local standards for permissible exposure limits. Even though ACGIH guidelines are much stricter and are not formal regulations, many manufacturing companies elect to follow the latest TLV guidelines because they are updated on a more frequent basis. The ACGIH regularly reviews toxicity data on common industrial compounds and adjusts its guidance based on the newest research. Why the Concern Over Manganese? Manganese, a gray-white metal, is used extensively in steelmaking. The element’s desulfurizing and deoxidizing properties make it a key ingredient in the making of steel and other alloys. Metal fabricators should be aware of the dangers of overexposure to manganese because the element is prevalent in their work environment. It is commonly found at varying levels in many welding rods and filler metals, especially for those welding applications in which hardness is desired. For example, a company fabricating a blade for an earthmover probably would use a welding wire containing manganese. When the welding arc hits the manganese, the metal heats up and reacts with the oxygen in the air, creating manganese oxide fumes, which can be easily inhaled by a welder if appropriate controls are not in place, such as ventilation or personal protection equipment. Scientists know that prolonged exposure to manganese can prove to be very unhealthy for workers. That link first was made back in 1837 when a British scientist witnessed neurological processing problems with Scottish workers responsible for grinding manganese. Today, manganism, which results from long-term and excessive ingestion or inhalation of manganese, has been linked to weakness, lethargy, paralysis, tremors, and speech and psychological disturbances. 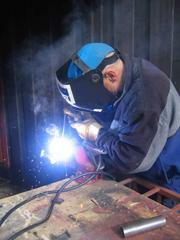 Metal fabricating companies may be aware that welding consumables manufacturers have been targeted several times over the past decade by lawsuits claiming that ailments experienced by former welders were brought on by longtime exposure to fumes generated during the welding process. In a large majority of these cases, the welding consumable manufacturers have successfully defended themselves against the charges. Although the new TLV-TWA limit of 0.02 mg/m3 is a dramatic change for those companies seeking to follow the ACGIH guidance, the new TLVs can be achieved with some combination of existing fume ventilation technology, changes in welding procedures, and respiratory protection. The first step for many metal fabricators will be to review material safety data sheets for materials containing manganese. Then they might consider having a certified industrial hygienist or a safety professional evaluate manganese exposure levels for workers on the shop floor. Once that exposure data is collected, the metal fabricating company’s management can determine how best to proceed to reduce the amount of exposure to welding fumes to acceptable levels. In many instances, a change in work procedure and addition of ventilation equipment won’t be enough to reduce exposure to acceptable levels. In those cases, respiratory protection may prove to be a suitable solution. Several respirator types are available, and they range in price from $1 for a basic negative-pressure, disposable, filtering face respirator to $1,000 or more for a powered air-purifying or supplied-air respirator system. The respirators should be selected based on results from air sampling and the necessary assigned protection factor as established in the OSHA Respiratory Protection Standard 29 CFR 1910.134. If a metal fabricator elects to use respirators, it needs to implement a written respiratory protection program per OSHA rules. The written program includes guidance on how to select the right respirator, how to use the selected devices, and care and maintenance of the equipment. If respirators are required, a medical evaluation is needed prior to implementing the program, and each welder needs to undergo fit-testing to ensure that the respirator forms a tight seal to the face.